Many know Lisa Hendey as the editor and founder of the popular CatholicMom.com website, a Catholic speaker, host of the popular Catholic Moments podcast, and a writer with Faith and Family Live. Now, she can add “successful book author” to her list of credits. 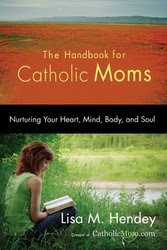 The beautifully written “The Handbook for Catholic Moms, Nurturing your Heart, Mind, Body and Soul” –focuses on mothering topics unique to Catholics as well as the issues faced irrespective of faith. The Handbook offers many practical, helpful suggestions, infused with personal stories and quotes from some of our favorite Popes and Saints. By beginning every chapter with one of Lisa’s own personal stories related to the chapter, Lisa hooks the reader. I found each story captivating and reassuring, filled with emotion that reminds each of us that we are facing the same issues together. Weaved throughout the personal tidbits of her own experiences, Lisa gives the reader support and helpful, practical information on the topics. By opening herself up and sharing those personal stories contained in each chapter, Lisa really connects with the reader. So much of what she writes could be my story, or where I hope my story takes me in a few years. She identifies things so much of us struggle with as a Mom – interfaith marriage, taking little kids to mass, finding time (making time) for personal prayer, committing to healthy living, and managing our schedules among household chaos. In fact, as I read through the book, I felt as if it was written specifically for my life – a book just for me filled with wonderful examples, suggestions and personal stories to which I can easily relate. This is a great gift for Mother’s Day! Get one for all the mothers in your life, even for yourself. Lisa’s creative way of connecting her own passionate journey with your own means that her book truly becomes a Handbook to guide us in our own lives as Catholic Moms. Lisa, thank you so very much for your incredibly kind review of my book! I so greatly respect your writing, so your comments mean the world to me! I hope you have a blessed Mother's day!